If the Oriental Dollarbird (Eurystomus orientalis) is supposed to be a common bird in Singapore, then why is it that I’m only seeing this for the first time? From afar it looks like a dark coloured bird but if you manage to get a closer look at it, you’ll find that its chest feathers are blue and its wings have a greenish sheen. Since it was my first encounter with this bird, I couldn’t help taking several shots of it. Apologies that this next photo was a little blurry as I was laughing at its comical expression when I took this! Several die-hard bird photographers were waiting to get shots of the Dollarbird in flight and I decided to wait with them for a bit – let me tell you that this really is a test of your patience!! The experienced birders told me that this bird is rather territorial and whenever it appears, the smaller birds will fly away, so if you are hoping to get pictures of other bird species, your chances of spotting them have been greatly reduced by this one’s arrival and until it decides to fly away, all you’ll be seeing is this Dollarbird for an extended period of time. I don’t usually like winter but I braved the cold temperatures this year to go try to spot the Japanese Red-Crowned Cranes (Grus japonensis), also known as Tancho「丹頂」. The Japanese crane is considered to be sacred and is also seen as a symbol of fidelity, love, good luck and longevity. It is also the second rarest crane species in the world. These tall, graceful birds are mainly white in colour with black lower wings. In male Japanese cranes, the cheeks, throat and neck are also black, whilst in females they are a pearly-grey. Adults have a bare patch of skin on the crown of the head, which is bright red in colour. The bill is an olive-green colour and the legs are black. Juvenile Japanese cranes are similar in appearance, although they lack the red crown and have black-tipped outer flight feathers. Outside of Japan, approximately 1400 Japanese cranes live in the Amur River basin in Russia and north-eastern China. Within Japan, these cranes are usually found at the Kushiro Shitsugen in Hokkaido, but they will emerge from the forests during the winter to gather around feeding stations, so this is the best season to spot them! Of the various species of cranes, this is the only one that breeds in Japan! These cranes were designated as a special natural monument of Japan in 1952. There are several places where you can go to view them in Hokkaido, but some are actually kept in aviaries, which in my opinion takes the fun out of wildlife spotting. In order to preserve the country’s largest wetland and marsh habitat which supports the only known population of the endangered Japanese Cranes in Japan, this marshland in Hokkaido was designated as a National Park in 1987. Do note that the cranes are best seen in winter when they gather at the winter feeding sites, otherwise they retreat deeper into the wetlands during the non-winter months. We did go through the marshlands by train and also by bus but both modes of transportation moved too fast for us to take any decent pictures, although we did see Sika Deer and Japanese Cranes along the way. If your visit coincides with the time of the year when the seasonal sightseeing trains run, I would recommend that you try to book a seat on these trains as they move at a slower speed and will allow you a better chance of spotting the wildlife. Tsurumidai is a feeding ground with no facilities, but there is a cafe/restaurant and gift shop located across the road. This is more of a breeding sanctuary for the cranes and visitors can observe the birds which are in fenced enclosures. The Akan International Crane Center is a museum, breeding center, and sanctuary where cranes can be seen year round. It has a good exhibit about crane history and ecology with English explanations. In my opinion, this is the best spot for viewing these beautiful birds!! Due to a packed tour itinerary, I didn’t have time to go check this place out, but they do have a Japanese Crane enclosure. The Kranji Marshes opened to the public in February 2016 but my schedule had not allowed me to check it out until now. This is a 56.8-hectare freshwater marshland that located along the northwestern shore of Kranji Reservoir and is one of the largest freshwater marshes in Singapore. More than 170 species of birds, 54 species of butterflies and 33 species of dragonflies can be found here and it is an important habitat in the Kranji area for the conservation of biodiversity, especially marsh birds. I decided to sign up for a two-hour guided walk organised by NParks for my first visit but it took me 4 attempts before I got a place on the walk!! There’s a limit of 20 people per slot and you’ll need to register your interest with NParks, after which all applications will be subjected to balloting and you will then be notified a few days before the walk as to whether you have been selected. The sky was rather gloomy as I made my way there on a late Saturday afternoon and we met up with the NParks volunteers at the Kranji Gate. We were then split up into 2 groups for the walk. The area immediately next to the Kranji Gate has a small pond with noisy frogs in it but they were so well hidden amongst the reeds that I couldn’t spot them although I could heard them croaking away! This area has been quite tastefully landscaped with a nest-like archway at the end of the path. We lingered here for a bit as we could hear various bird calls and thus tried to spot the feathered creatures. Unfortunately there was a lot of backlight and thus I couldn’t really make out all the bird species, as seen in my photographs below. I’ve attempted to identify them to the best of my knowledge. I learnt from a signboard after the nest-like archway that this area is called “Neo Tiew Woods”. It’s about a 1km walk from here to the “Marsh Station”, where the observation tower is located. Along the way, we spotted a few more birds and these were the noisy ones as we could hear them screeching away at the top of the voices! Couldn’t help taking more pictures of it! It’s supposed to be a common bird in Singapore but somehow this was my first time seeing it! This next bird was so well camouflaged and I wouldn’t have spotted it if not for our experienced NParks guide! Can you spot the bird in the picture below? If you couldn’t find it, here’s a close-up of the Large-tailed Nightjar (Caprimulgus macrurus), which is a nocturnal bird and it appeared to be snoozing. It rained heavily about 10min before we reached the Marsh Station and I later spotted an Olive-backed Sunbird (Cinnyris jugularis) which looked like it had been soaked from the rain. …and the Kranji Tower can be found here. There are some bird hides in this area too, but I didn’t manage to spot anything apart from swiftlets that flew too fast for me to photograph them. As part of our guided walk, we were allowed access into the restricted area (i.e. 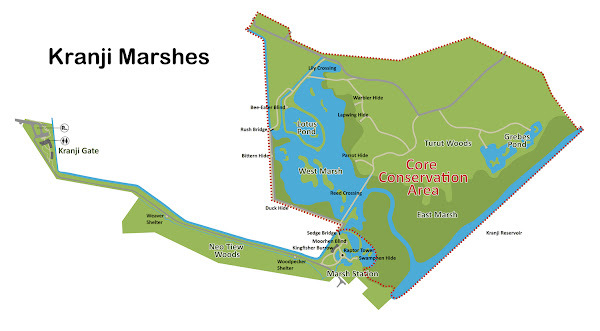 core conservation area), which is for researchers only and thus not opened to the public (unless you are on a guided tour) as this part of the marshes is considered to be ecologically sensitive. We went to the first bird hide (Duck Hide) in this area and couldn’t spot anything with our bare eyes. Our experienced NParks guide then pointed out a Stork-billed Kingfisher (Pelargopsis capensis) perched on a branch at the opposite end of the lake. This was the best shot that I could take as I didn’t bring a tripod with me. Alas we couldn’t venture further into this area as time was running out and we had to make our way back to the Kranji Gate for those who needed to catch the last bus at 18:33 back to Kranji MRT. This concludes my first visit to Kranji Marshes and it was a fruitful 2 hour visit considering that I managed to spot several different bird species, although not the ones that I hoped to see as found on the signboards at the various bird hides. Probably most of them went into hiding due to the rain. Opening Hours: 7am to 7pm daily. 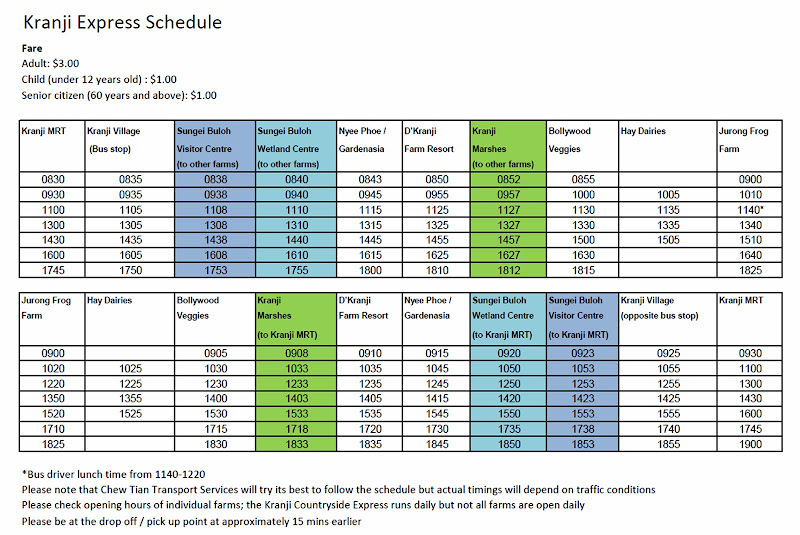 By MRT/Bus: Take the MRT to Kranji station, then take the Kranji Express shuttle bus and get off at Kranji Marshes. Drive to Neo Tiew Lane 2 and the car park at Kranji Gate is located just next to the D’Kranji Farm Resort. Tsurumidai「鶴見台」 is a feeding ground for Japanese Red-Crowned Cranes (Grus japonensis) and the feeding only takes place during the winter months from November to March. This is done twice daily – once in the morning and the second time in the afternoon at 2:30pm. Japanese Cranes started gathering in this feeding field around 1963 and this was in the vicinity of an elementary school. As winter can be quite harsh in this part of the country, the teachers and their students started the practice of feeding the cranes during the cold, bitter months. When the school eventually closed down in 1974, Tome Watanabe, who lives nearby, took over the current crane feeding practice. Note that there is no guarantee on the number of cranes you can see during your visit as it depends on how many birds decide to visit this site. I also spotted a Eurasian Jay (Garrulus glandarius) during my visit and I thought it looked rather comical! There are no facilities at this feeding ground except for a parking lot which can accommodate a few tour buses. A restaurant and gift shop can be found across the street. Shimosetsuri, Akangun, Tsuruimura, Hokkaido, Japan. Feeding Times: Twice daily – once in the morning and next at 2:30pm. By car: About a 55min drive from Kushiro Station, located directly beside Route 53. By Bus: Akan Bus「阿寒バス」 鶴居Line or 幌呂Line from Kushiro Station and alight at Tsurumidai. The journey takes about 1 hour and the fare costs ¥1000. Little Egret (Egretta garzetta) – A common winter visitor and passage migrant, it can be found in several parts of Singapore throughout the year, but mainly between September and April. White-breasted Waterhen (Amaurornis phoenicurus) – This is one of the commonest waterside birds which is seen singly or in small groups, along the edges of rivers, swamps, marshes, mangroves, reed beds, grasslands, canals, water-logged drains, padi fields, gardens and parks or open grassy verges by roadsides, even along the edges of jungle but not in dense forests. When disturbed, it tends to run very quickly to seek shelter in the nearest patch of tall grass. White-throated Kingfisher (Halcyon smyrnensis) – A common resident throughout Singapore. This was my first successful attempt at photographing one as they tend to be startled easily and take off at the blink of an eye. Unfortunately due to the backlight, I didn’t manage to get any clear enough pictures. Common Kingfisher (Alcedo atthis) – A common winter visitor and passage migrant found throughout Singapore. It’s sooo cute!! I was on my way to afternoon tea at Upper Thomson and we had just finished parking, so I was about to step out of the car when I noticed something tiny flitting about in the flowering bushes that were next to the car. It was chirping as well, so I decided to sit in the car with the door halfway open and had my camera out. Initially I thought it was a hummingbird but I later learnt that it was an Olive-backed Sunbird. The Olive-backed Sunbird (Nectarina jugularis), also known as the Yellow-bellied Sunbird, is a species of sunbird found from Southern Asia to Australia. According to various internet resources, the male of this species is more colourful than the female. Male: Metallic blue-black forehead, throat and upper breast, contrasting with bright yellow underparts; upperparts dull olive brown. Female: Upperparts dull olive brown; underparts all yellow, brighter yellow than other female Sunbirds (females of most species of Sunbirds look very similar). Ok…so this one’s a male. Sunbirds feed largely on nectar, although they may snack on the occasional insect. Their flight is fast and direct on their short wings. Most species can take nectar by hovering, but usually perch to feed most of the time. Olive-backed Sunbirds were originally from mangroves, but have spread to forest margins and secondary growths, to parks, gardens and even some people’s homes! They are apparently supposed to be the most common Sunbird in Singapore and are found almost everywhere except the deepest forest. The Berlayer Creek trail is a segment of the Labrador Nature & Coastal Walk which was officially opened on 2nd January 2012 and I had been meaning to check it out but unfortunately didn’t get a chance to until today. It’s very accessible as the entrance to the trail is just beside the Labrador MRT station. If you drive, there is a small carpark located next to the MRT exit (coupon parking, free parking only on Sundays). However, if you opt for free parking, you can park at Labrador Nature Reserve’s Car Park ‘C’ and start from the other end of the trail. There is a huge sign which is visible from the main road and marks the start of the trail at the Labrador MRT station. The Berlayer Creek trail is quite an easy walk and is wheelchair accessible. It was a Saturday afternoon and only one jogger and an amorous teenage couple were out and about at this end of the trail. Although it was my first time here, I wasn’t expecting to see much wildlife as it was still high tide when I arrived. Several terrapins could be seen swimming around the mangroves. In the span of about 1.5 hours that I was there, the tide gradually went out as you can see from the following two pictures. The one on the left was taken when I arrived and the one on the right was taken when I left. Mangrove roots are exposed at low tide and you can get a better look at them. See if you can spot him in the next photo! I couldn’t help noticing the big red ants that were scurrying along the wooden handrails. They even managed to get themselves safely across the gaps between the handrails!! There were also quite a number of butterflies which I spotted along the way but some were too quick and I didn’t manage to photograph them all. If you compare the following two pictures, you can see that this butterfly had unrolled its proboscis. On one side of the trail is the creek and the other side a field of long grass. There were several bird species hiding in the long grass like the Common Myna (Acridotheres tristis) but this one caught my attention. I later learned that it’s a Chinese Pond Heron (Ardeola bacchus)! They are currently in winter plumage. Minutes later, several Yellow-vented Bulbuls (Pycnonotus goiavier) were seen hiding amongst the tree branches. They were rather shy and flew away at the slightest noise or movement. There are two rest points along this trail and this was the first one. We saw a water monitor (varanus salvator) struggling with something in its mouth. Using my camera’s zoom, I discovered that the monitor lizard was trying to swallow a large fish which was bigger than its mouth!! It was struggling and turning its head from side-to-side to try to swallow its prey. Walked to the second rest point and a group of tertiary students were there playing some games. I didn’t spot anything else there and made my way back to the car park as my parking was up. If you are into plant life, here are some of the flora which can be found along the trail. There was a lovely field of yellow flowers. It was quite a fruitful nature walk and I will definitely be back (hopefully more birds can be spotted on my next visit)! The Tegenungan waterfall is located in the Tegenungan Village, Kemenuh, Sukawati district, Gianyar, Bali. It’s approx. 5 km south-east of Ubud. Upon entering the vicinity of the village, at the entrance of the road leading to the waterfall, the parking attendant in-charge will collect IDR 5000 from each person visiting the waterfall. Hmm… wasn’t aware there was an admission charge before I went! Anyway, I couldn’t find any official tourist info on the web about this place. It’s about a 5-min walk from the parking area to the observation point where you can get a top-down view of the falls. The waterfall is quite impressive and the force of the waters is quite strong. You can walk to the base of the falls via a steep flight of 121 steps. Those who have knee problems may want to think twice about walking down and take the necessary precautions if you do so (cos each step is quite high). It takes about 10mins to walk down (but a lot longer trying to climb back up!!). The paved path ended and we had to hop over several rocks, trying very hard not to lose our balance in the process and fall into the water or onto the other rocks. I don’t have a picture of the path and the rocks which we had to hop over as I was concentrating hard on making sure I didn’t lose my footing. I love nature and found this wetland on the Naha map so I decided to check it out. Unfortunately there isn’t much info on their English website. A model of the Black-faced Spoonbill (クロツラヘラサギ) at the visitors’ centre – we came here to try to spot the real thing…. 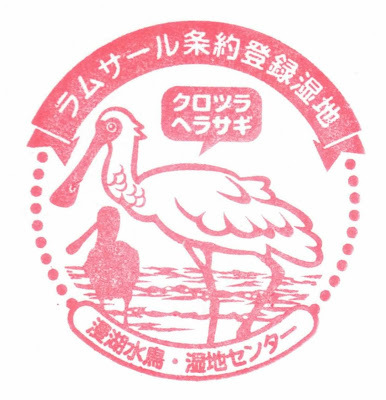 Headed to the Toyomi Ohashi bridge (とよみ大橋) to look for the Black-faced Spoonbill…. We spotted a black-faced spoonbill which was busy looking for food and was walking around a lot. Too bad my camera’s zoom isn’t good enough to take better wildlife pics (only 18x optical zoom). There were supposed to be 2 or 3 of them but the rest were out of sight. One of the bird hides overlooking the wetlands. Take the Okinawa Urban Monorail (Yui Rail) to Ōnoyama-kōen station. The Manko Waterbird & Wetland Center (漫湖水鳥湿地センター) is about a 1.2km walk (approx. 15min walk) from the station. Redang Island, locally known as Pulau Redang or just “Redang” is one of the largest islands off the east coast of Malaysia. It is one of of nine islands, which form a marine park and offers snorkeling and diving opportunities. I had heard about Redang for a long time and thought of going there but never got around to booking the trip until Star Cruises offered a 3 Day 2 Night Cruise to Redang and I managed to get a 1-for-1 deal on it! Signed up to go snorkelling at the Pulau Redang Marine Park and this first picture was taken whilst we were making our way there. Arrived at the Pulau Redang Marine Park and here’s the view from the jetty. The waters looked crystal clear with a nice white sandy beach. 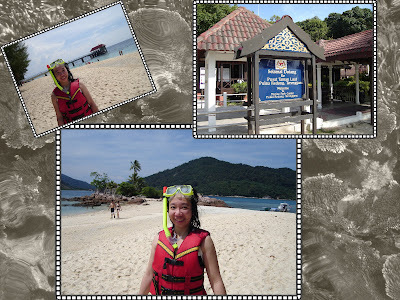 Welcome to Pulau Redang Marine Park!! This sight greeted us at the other end of the jetty. This is a picture of the jetty which we had arrived at earlier and one of the boats which was ferrying passengers to/from the cruise ship. Spent an hour snorkelling before the tide started coming in and the sea got a little rougher and the rocking of the waves made me feel sick. Unfortunately I didn’t have an underwater camera with me so I couldn’t take any pictures whilst snorkelling. These are some of the shots of the marine life at Redang which were taken from the jetty. As you can see, the waters are very clear and you don’t need to snorkel to view the fish and the corals in the water. Many of the corals looked like they were already dead but fishlife was plentiful. I had tried to touch the fish which swam close to me but all of them shied away and they were quick too! Overall, it was a relaxing afternoon and I enjoyed the clear waters and the abundance of marine life. However, I think I still prefer snorkelling at the Great Barrier Reef as there’s a lot more to be seen there.